Washington, D.C. is plagued by political weaponization of government, law enforcement, and media, the likes of which America has never seen — all coordinated and perpetrated by the Democrats and their Deep State allies. According to The New York Times, the FBI secretly investigated President Trump based on concocted claims that he was working with the Russians against American interests. They officially launched the “investigation” — which they had long been running unofficially — after the President rightly and justifiably fired James Comey. As a pathetic excuse, the disgraced and fired former FBI Assistant Director Andrew McCabe and Agent Peter Strzok focused on isolated and innocuous statements made by Donald Trump regarding Russia during and after the 2016 campaign. No one at the bureau could have genuinely thought President Trump was a Russian intelligence asset working on behalf of the Kremlin. The FBI, including Director Comey himself, knew that not a whit of the “Steele Dossier” was verified before or after they took it to a court four separate times to get the most intrusive of all warrants against American citizens. 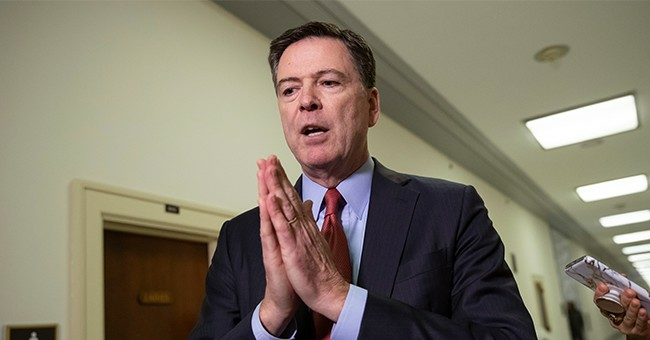 Comey publicly stated that there was still no evidence when the matter was handed off to Special Counsel Robert Mueller. All evidence to date points to the FBI leadership playing a hideous political game to stop Mr. Trump from becoming President, and when that failed, to undermine his presidency because of their aversion to his policies. Let’s begin with the obvious — if President Trump’s foreign policy views warranted an FBI investigation, then why didn’t the bureau probe the pro-Russia stances of former American leaders such as Barack Obama and Hillary Clinton? Many forget that President Obama once told his Russian counterpart at the time, Vladimir Putin lackey Dmitry Medvedev, that he would have “more flexibility” after his re-election in 2012 — an ominous indication that Obama was cutting secret deals with the Russian government behind the scenes. Remarkably, he then stood by and did nothing as Putin invaded Ukraine. Likewise, Hillary Clinton was never investigated for her disastrous “Russia reset” in the early years of the Obama administration and received no meaningful scrutiny for the sale of Uranium One to Russia despite receiving $145 million in donations from some of the people involved in that transaction through the Clinton Foundation. Astute historical observers may even remember that President Bill Clinton helped Russian President Boris Yeltsin win a domestic power struggle and break a military coup. Just imagine how the Democrats and the media would react if President Trump authorized a similar operation to keep Putin in power. Then there’s Senator Dianne Feinstein, a member of the “Gang of Eight” and a member of the powerful Senate Intelligence Committee, who employed a Chinese spy for 20 years. Did the FBI treat her as a Chinese asset? No, they went directly to her and briefed her on the problem. They allowed her to let her spy quietly retire, and it was all but completely swept under the rug — regardless of what may have been extraordinary damage done to our intelligence community. The Democrats have long argued that there is something unusual about President Trump’s foreign policy, and that his pro-Russia remarks should concern Americans. Yet, some of the most prominent U.S. political scientists in the field of international relations, including Stephen F. Cohen and John Mearsheimer, have long supported a pro-Russia foreign policy, arguing that it is necessary to offset China’s rise. While there is no reason to believe that President Trump colluded with Russia, there are plenty of reasons to question the ethics and actions of the FBI under President Obama. One need only look to James Comey’s memo from the day of his meeting in the Oval Office with President Obama before he was dispatched to brief President-Elect Trump on only the “salacious” aspects of the Steele Dossier. That purposely set the hook needed for Clapper or Brennan to leak it all to the media for its explosion into the press. Comey said he executed it exactly as he had planned. Former U.S. Attorney for the District of Columbia Joseph diGenova and former chief counsel for the Senate Select Committee on Intelligence Victoria Toensing, for instance, argue that the FBI went astray when it used the unsubstantiated dossier funded by Clinton’s campaign as a justification to wiretap one of Donald Trump’s campaign advisors. The FBI has become increasingly politicized over the last 20 years. According to the decision of the FISA court, Director Comey gave illegal access to raw NSA data to three private contractors as early as 2015. That led to unprecedented unmaskings and likely contributed to the crafting of the Steele Dossier. Although the names of the private contractors are redacted, there are reasons to think one may be Fusion GPS — the Clinton/DNC funded group that promoted if not co-created the Steele Dossier. “The rotting of the FBI hierarchy escalated when then-Deputy Director Andrew McCabe and then-agent Peter Strzok, enabled by former Director James Comey and the Obama-era Justice Department, utilized an ‘unsubstantiated’ dossier created by former British spy, Christopher Steele, and financed by the Clinton campaign, to request a FISA warrant to wiretap Trump campaign advisor Carter Page,” Toensing and diGenova maintain. Washington, D.C. really is a cesspool of collusion — but it’s not imaginary collusion with Russia that threatens our democracy; it’s the collusion among unelected bureaucrats to overturn the people’s choice to elect Donald Trump as President.